SUGGESTED TEXT: On the previous page, Yori had an outburst over the mention of Hirotomo’s victory over Genchu, but then Ryoku gives some more speech about how useless Yori is before saying on this page that he’s hit a nerve. 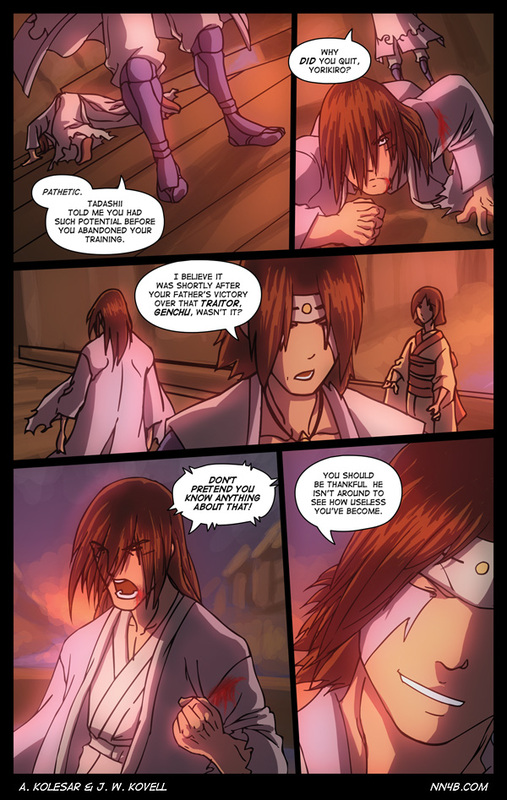 Maybe change to “Have I hit a nerve?” or have Yori say something like “Shutup!” in the first panel so that he appears like he’s having a nerve hit just then. Yori is seething in anger now! I disapprove of your suggestions. I think they already changed it. My post was written back in a time when they were preparing to publish the NNFB books and had done a lot of changes to the previous page quality, layouts and a small bit of the story. 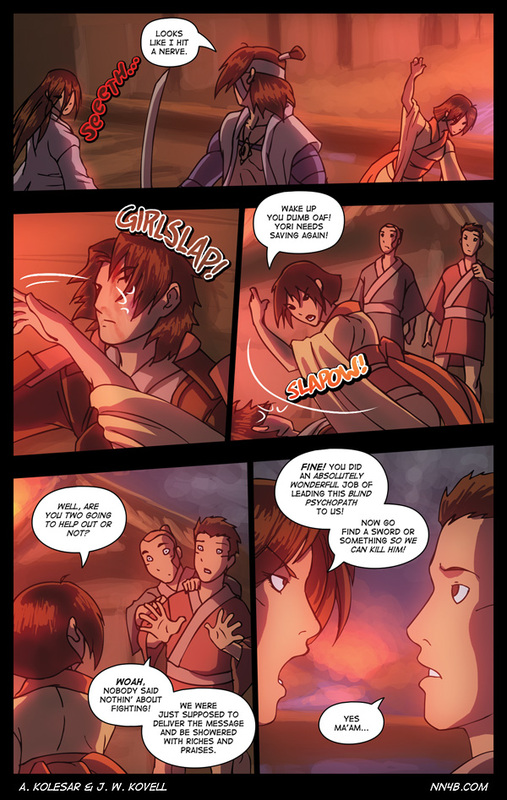 They’ve added the “seeeeth….” SFX to Yori because changes to the pages and script ment there was no indication as to why he’d presume he’d hit a nerve with Yori after his last comment on the previous page. Not gonna lie, we kinda George Lucas’d the snot out of the comic. I think the revisions have been good though. I mean, you needed them anyway to fit the pages into book format. But the tone of the comic had changed over time as well. Previously it was extremely slap-stick and Yori was always shown to be utterly pathetic to a point that his current success is far too unbelievable. I think your revamp successfully avoided destroying the heart of the story and only brought it up to par with the newer, better tone and the greater, over-arching storyline. That’s wonderful to hear from someone who’s read through the archive before and after the changes! Although some people liked the old version; nostalgia can be a powerful emotion. We’re thinking about compiling the old version of volumes 1&2 into a PDF for readers who want to read the pages as they once were. I’m simply recalling that the previous time I went through the archives, the comment system was different… i.e. it was the previous, overwritten comment system which predated your recommendations… and honestly the comic was mostly fine back then… The things you’ve suggested honestly seem to have made it worse, as far as I can tell. I think that should be seethe in the first panel. Otherwise it’s just a stretched-out Seth.